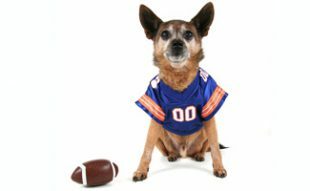 Home > Play > Dog Trivia > What Is Your Dog Breed’s Average Neck Size? Ever wonder what the neck size of your pup was and how it compares to other dogs? Or maybe you got a new dog and need to know what size collar to get for him? Search for your dog breed to find the right size collar for your pup. 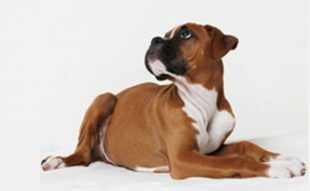 If your dog’s breed is missing, let us know with a comment below, and we’ll add it to the list. Thanks! What is neck size for teacup & toy Schnauzer? Sorry, I couldn’t find those neck sizes online. Glad to see our listing is in line with your dog! Sorry, we couldn’t find the neck size for that breed. Sorry we couldn’t find those specifics online. Whats the average neck size for a male German Pinscher. Thanks in advance for your help! Sorry, we can’t find the average neck size for German Pinschers. What is the average neck size for a female English Setter? I did not find the average neck size for a female Boykin Spaniel. Thanks in advance for your help! I’m sorry, we couldn’t find the average neck size for an English Pointer. Did not find the Pumi breed. Looking for average neck size for male. Sorry we couldn’t find the neck size for a Pumi. Are you referencing West Highland White Terrier? If so, you’ll find it above (14-16″; 15-22 LBS). dog’s neck is 16 1/2 inches. What size collar? You will probably need a large, but each brand can be different. See if the collar states what sizes it fits minimum and maximum. Can you add the Cavapoo please? Sorry, we can’t find the average neck size for cavapoo. Hi I don’t know if this would help but I have a pit bull his neck size is 20 inches. He is 65 pounds.. So you have a list for chest sizes? Sorry, we do not have chest sizes. In regards to the australian cattle dog; Is this the puppy size? because it’s similair to the adult sizing i’ve found on other websites? The sizing is for the weight next to the breed. So for a 31 to 35 pound Australian cattle dog, the neck size is 22″ to 28″. I love you for this SO incredibly much. I know every individual dog is different, but when you’re trying to future plan and buy stuff for a soon-to-be-puppy/dog, it’s nice to have somewhere to work from and then adjust from that instead of blindly guessing and getting frustrated. So glad you find it helpful, Stephanie! Neck size for Olde English Bulldogge? Sorry Autum, we couldn’t find the neck size for that breed. English Bulldogs and Olde English Bulldogges are not the same. 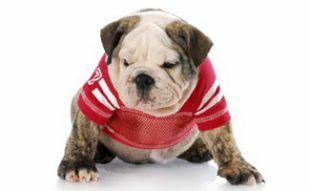 English Bulldogs are smaller, weighing around 40-50 pounds. Olde English Bulldogges weigh around 60-80 pounds. 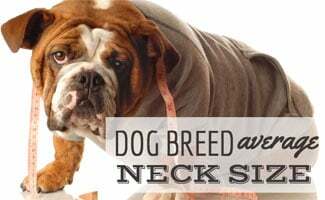 Unfortunately, we couldn’t find information regarding Olde English Bulldogge neck size. We couldn’t find a specific neck size, but you’ll most likely need a small or medium size collar if your Pomsky is 18-45 pounds. Sorry, I could not find the average neck size for boerboels. What about when they are a puppy? What size do you recommend for a mini golden doodle puppy? For a puppy you’ll probably want a small collar, but depends on the size of the dog. Thanks for your inquiry. Basenji has been added to our list. I have a 8 month Shichon 11 lbs. What would the collar size be? 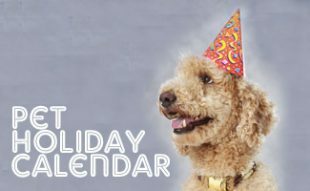 Since a Bichon’s neck measures 14-18″ and a Shih Tzu’s neck measures 10-14″, the ideal size for an adult Shichon would be a collar that adjusts 10-18″ but if you need to pick, perhaps go with the middle of the two measurements at 12-16″ adjustable. Keep in mind that Shichon’s tend to vary widely in their weights and your puppy may still be growing. If you want to get a perfect fit today, you can simply measure your dog’s neck. Then add a few inches for growth in the future. Sorry, I couldn’t find the average neck size for a bulgarian shepherd. Hi Michele, we found the average collar length to be 10 to 14″ for a 14 to 45 pound Schipperke.